Hello and welcome to exampundit. 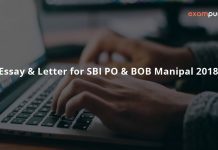 Here are the much awaited Descriptive Topics for SBI PO 2018 along with a Contest. Peer to Peer Lending in India – Boon or Bane? Write a letter to the editor sharing your view on Banking Scams and how to tackle them. Write a letter to the Bank Manager informing Fraud Transaction in Your Parent’s Bank Account. You are allowed to research and compile data to pen your essay/letter. 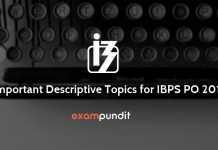 Exampundit solely reserves the right to accept/reject any entries. The points awarded to aspirants will be unbiased and at no point will be changed. Unless there is any typing error. There are NO CHARGES OR FEES TO PARTICIPATE IN EP’S DESCRIPTIVE CONTEST. Participation is Absolutely Free. Exampundit reserves the right to amend/change any rule/terms at any point. Winner & runner-up will be decided at the end of the contest. Winner and runner-up will get gift from exampundit.